Reader Wadeanne Nardo is confused by her DNA results on AncestryDNA. It’s easy to see why Wadeanne is — and many others are — confused by these. If you read through the explanations on AncestryDNA,1 it’s easy to be left with more questions than answers. Personally, I love the way Diahan Southard refers to DNA Circles and New Ancestor Discoveries. She calls them parties where your genetic code is your ticket.2 But when and how your ticket gets punched can be pretty confusing. Let’s start with the DNA Circles. • That particular person is at least a fourth great grandparent (or closer) to the three of you who share DNA. If you match five other people who have this person in their trees, but you’re all sixth cousins, there won’t be a circle created. If the public trees of the people you do match don’t include this person, there won’t be a circle created. Even if the public trees have differences in the way this person is identified (a significantly different name or birthdate or birthplace, for example), the circle may not be created. If you match lots of people and you all have the particular person in your trees, but their trees are all private, the circle won’t be created. That doesn’t mean everybody in the circle matches everybody else in the circle. Any match only has to match two others to be added, and the matches can be to different members of the circle. 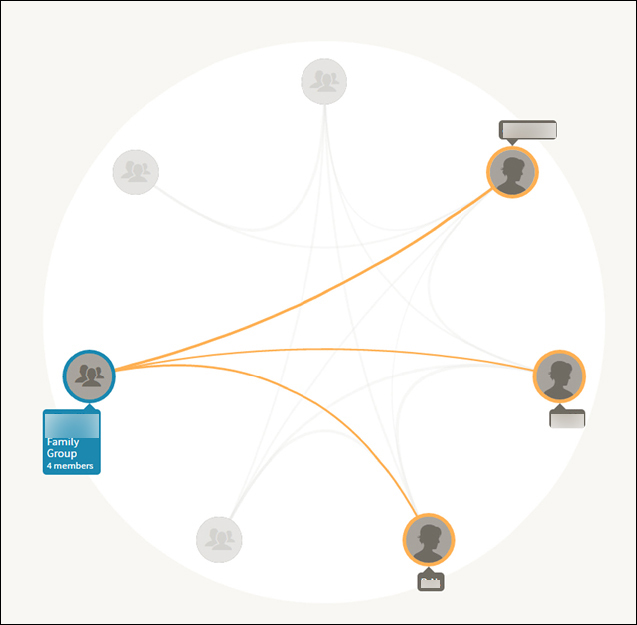 Take a look at the people from one of my circles below. In this first image, the woman in blue on the right matches each individual or at least one individual in each Family Group in the circle, so her icon is shown in the circle as connecting to every one in the circle. In the second image, we changed the focus to see who the matches are to the four-member Family Group on the left now highlighted in blue, and you can see that that group only has matches to three of the others — and not to the other individuals or Family Groups including my own. New people can be added to an existing circle as long as they have a DNA match to one member of the circle — they don’t have to match two others. That two-other-match rule only applies to creating a circle in the first place. So your ticket to a new party gets punched whenever you (or your Family Group) meets all of these requirements, but your ticket to an existing party gets punched whenever you have a DNA match to the partygoers. 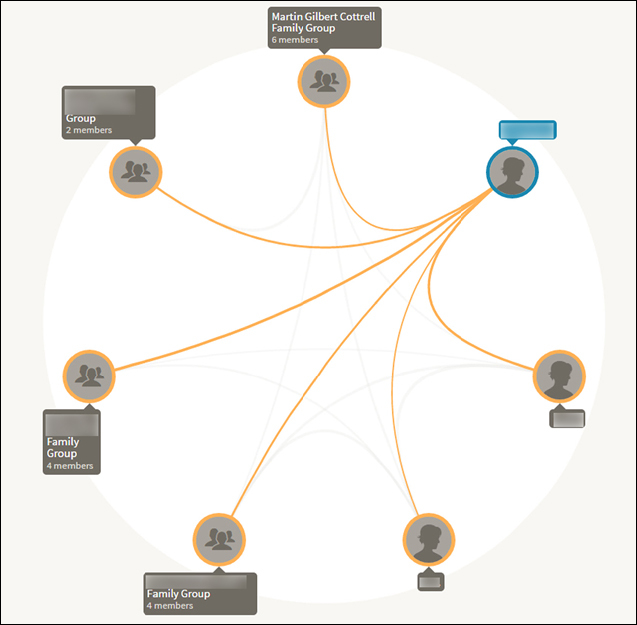 For a New Ancestor Discovery (NAD), let’s start with the fact that it’s a terrible name for this feature because, in most cases, the circle that’s being suggested for you isn’t an ancestor at all. It’s a potential relative, but it’s really not all that likely that it’s an ancestor. The idea is to help you find ancestors based on your DNA even if you don’t have them in your tree yet. So you’re going to get your ticket punched for this party whenever you share DNA with enough partygoers you would be in their circle if only you had the particular person whose party it is in your public tree. You can still get a hint to a family line to look at by reviewing the trees of folks in a NAD that’s suggested for you, but it’s the exception rather than the rule that the NAD ancestor is really an ancestor to you rather than a cousin or other collateral to you. DNA Circles and NADs can be very helpful — but they do have the capacity to mislead us if we don’t remember what they really are: they’re hints to possible lines that we share with others. In other words, take DNA Circles with a grain of salt — and NADs with the whole darned salt lick. The problem here is in the ambiguity of the word “ancestor”. Merriam-Webster provides two definitions for “ancestor”: (1) “one from whom a person is descended and who is usually more remote in the line of descent than a grandparent”, and (2) “a person of an earlier period and common heritage”. Because of this ambiguity, you will often hear people referring to a “direct ancestor” (and its corresponding term “direct descendant”), meaning ancestors as defined in the first definition. In other words, the “Ancestor” in “NAD” is an ancestor according to definition 2. Despite its “definition 2” accuracy, it’s a really misleading name. New Relative Discovery would have been so much better. That would be a better name and maybe suggest it to Ancestry. I will say that through one I had success. She turned out to be a Sister of my 2nd Great Grandmother- I was able to smash through a 50+ year brick wall and find my 3rd Great Grandparents. I have census records and his will. He died when she was two years old. Two cousins had done extensive research & written a book in the 60’s & no one had found anywhere new since. Thanks to DNA & the NAD, I was able to solve the puzzle. Are they all that easy? Heaven’s no! But I sure am thankful for that one !! I don’t think someone NOT related by blood but only by marriage is usually considered an ancestor by individuals who have their DNA tested. Even though my grandfather’s first wife was a cousin of his second (my grandmother), and I share DNA with her, I would not even consider her an ancestor. Kin yes, but ancestor, no. Should the DNA genealogy companies be showing 5th cousins? Or, for that matter 4th. To me it clutters the playing field of people who are starting out, increasing mistakes in their trees, leading the searcher on false trails. Maybe these could only be shown on request? I think people under-estimate the value of distant relatives. We find direct ancestors (a 3x gr grandparent) tucked in with someone whose last name and relationship we don’t recognize on a census report – this person can turn out to be a 4th or 5th cousin, which we may have verified through a DNA match. Most of my DNA matches – and those of my son, my sister and my 2 cousins – are 4th cousins. I’ve used them to find and confirm direct lines and help with brick walls. 5th cousins sometimes turn out to be 4th cousins. And some of my sister’s estimated 5th cousins turn out to be 4th cousins to me. It would be a bother to have to request all of them – I’d suggest you ignore yours if you aren’t finding them of use and focus just on the more direct lines. We are paying to see who we share our DNA with and those results will show who we match that also descend from our various great – to many times great – great grandparents. DNA alone is not an easy way to research your ancestry. You need to have your paper research in place first, and then be prepared to research more to see where your matches fit in. Side note – it’s nice to see other people’s trees, but it’s best not to copy any as your own if there is not documentation that backs up that their lines are your lines. If you do accept a non-documented branch that you find online, it might take you off course. This is a hobby that requires much patience and perseverance and you’ll be rewarded for it. You can choose not to search for a match with anyone beyond a 3rd cousin. Bottom line: DNA doesn’t lie – there are no ‘false trails’. I don’t have any problem with showing them, and would rather have them than not. got results mid-July so this is all totally new for me. Still a bit confused-well, maybe a lot confused. I have those DNA circles and for the life of me I cannot find the link to any of them or how I fit in. Thanks for explaining them though. I need to print out your explanation for future reference. @Stan 4th cousins have been invaluable to me as an adoptee. 5th – 8th are also very useful for confirming lines. Ancestors of spouses along a family line can indicate MRCA. Really, it’s about a preponderance of evidence using multiple approaches. What puzzles me is why hardly any bloggers don’t first start off by telling readers that you need a subscription to Ancestry.com at the rate of at least $20 a month (or $240 a year) to even see a NAD or Circle. I read in the blogs all the time where people are confused as to why they are not seeing any circles or matches and the result ends up being because they don’t have a subscription. I don’t have a problem with the service showing wives/ husbands or some other ancillary relative if it leads to the common ancestor. It may be circuitous, but hey, it is a circle. And to the comment about not wanting to see beyond 3rd cousins, that brings into question their whole concept of family. Most people unless adopted should know their 3rd cousins or could easily figure it out if you told them a last name or who they were married to and their last name. Fourth cousins and further gets back to when records were patchy, sketchy and even questionable in certain situations. That is why we have DNA and paper trails, to try and find not obvious links to common ancestors. And as an aside, I followed the link and read the article you mentioned. I have the Joseph F. Smith as a NAD as well through my sisters account. His wives, his son, his sons wife, his brother and his wife are all listed as NADs to my sister. So I think it is pretty obvious we are related some kind of way. We are African Americans and the connection is probably during slsvery times so the connection might be difficult if not impossible to find. The best reason for a blogger not to tell readers you need to pay $20 a month or $240 a year to see DNA Circles or NADs is… it isn’t true. Yes, Ancestry is a subscription service. But there’s a much less expensive DNA-only subscription called Insights that you can get for $49 a year by calling Ancestry. Great post! This is indeed the problem I am having with my NAD! This person is clearly not an ancestor of mine. She’s probably some form of distant cousin. This verifies my feelings on that. My complaint about DNA Circles is they can give the appearance of validity to ancestors who are incorrect. A case in point is the parents of my maternal 3rd g-grandmother, Winnie. “Everyone” on Ancestry has a certain couple as her parents. A will came to light a few years ago proving that the couple named as her parents are actually her aunt & uncle — they had a daughter by the same name but the will gives her married name. My mother is from an endogamous mountain county in NC so everyone in the circle certainly shares DNA. My sister & I have spent years putting together a reasonable hypothesis as to who her parents actually were, but have yet to find that magical piece of paper to actually prove it. We’ve taken our hypothesis to everyone in the DNA circle in the hopes of spurring other researchers. Most will not listen because they feel that being in the Circle “proves” that Winnie’s parents are the incorrect ones they have in their trees. In this case, I think the DNA Circle does more harm than good! No doubt that these can be misleading, Janis, and that’s why I keep emphasizing that they’re clues and that they only work with, and not instead of, paper trail research. The problem I see with the suggested name “New Relative Discovery” is that *that* implies that it could even be someone in my own generational level (a distant cousin, perhaps). How about “New Ancestral Relative Discovery” instead? Then we can talk about NARDs.